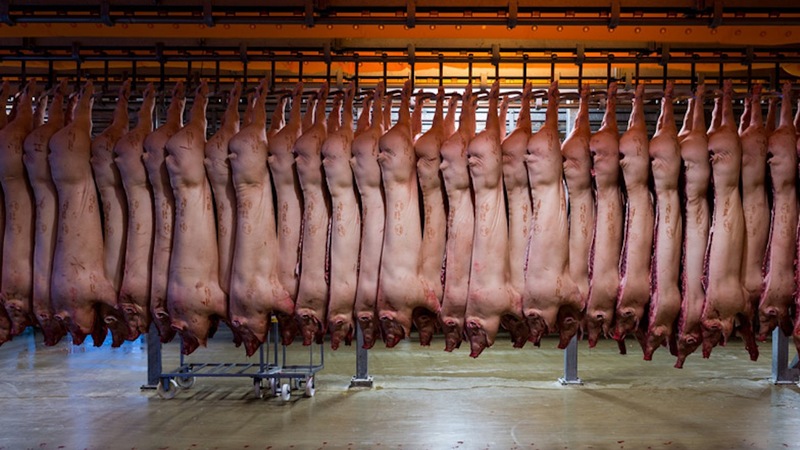 Slaughtered pigs in a slaughterhouse line, accessed October 8, 2016. (dezeen.com via Pinterest). It was as if it never dawned on anyone responding that this was far more than objectifying women. (The truth is, we all objectify, regardless of gender, as any form of attraction comes with this as part of the equation. It’s a question of the degree to which we do so). This was a case of putting “good” versus “bad” women on display. It was as if I had gone to Whole Foods, or, more aptly, Reading Terminal Market in Philly. But instead of butchers and mongers and other vendors with stalls selling cuts of boneless/skinless chicken thighs, prime rib, duck breasts, pork tenderloin, and fresh caught salmon, they were selling big butts, round asses, wide hips, perky breasts, and sanded feet. The post was straight up misogyny, and I all but dropped the person as a result of it. 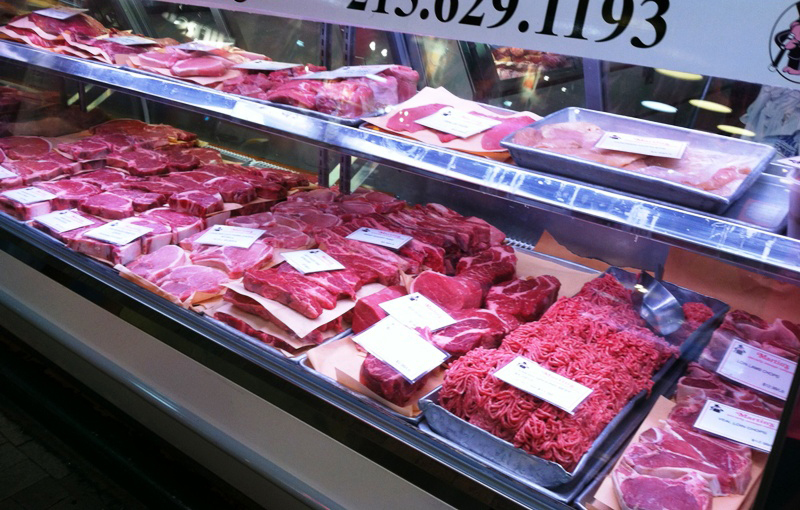 Cuts of beef, lamb, and pork (plus ground beef), Martin’s Quality Meats & Sausages, Reading Terminal Market, Philadelphia, PA, March 2013. (http://hobbiesonabudget). But it did make me think. The folks who responded acted as if they really were shopping for groceries, as if you could buy a woman at a store for say, $4.99 a pound, or find a sale where “prime rib” goes for $10.89 instead of $12.99 per pound. The key to this frame on misogyny, then, is literally how little the men in question valued women, and more specifically, Black women, physically and otherwise. After all, with an average weight of 140 pounds, $700 or $1550 is a clear-cut and sickening example of cheapening a person, with slavery auction overtones included. At the very least, if these alleged men were truly interested in any kind of relationship or a long-term commitment, a minimum of three additional zeros should be added to this misogynist numbers, no? Of course this isn’t the point, that no price tag should be put on the value of a human life, and on women specifically. It’s fairly obvious, though, that many, if not most, men and women think, speak, and act on this mindset. Donald Trump has been an example of this for decades. That it took the release of unused footage from an Access Hollywood clip from 2005 to confirm Trump’s meat-market views on White women is both sad and unsurprising. Sad because it’s as if many Americans haven’t paid attention to Trump’s ridiculousness since announcing his candidacy 17 months ago. Unsurprising because the tape reveals what those of us who have been paying attention over the past months — and in my case, years — already knew. 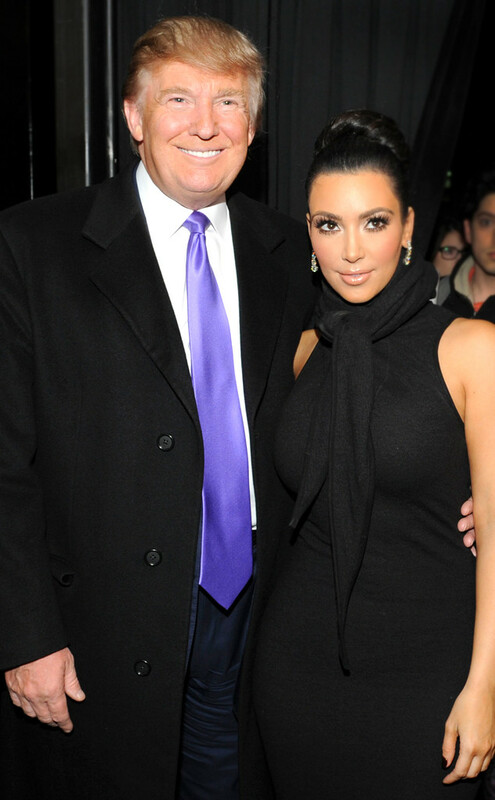 Donald Trump posing with Kim Kardashian at Celebrity Apprentice event, New York, 2010. (Mathew Imaging/WireImage via http://eonline.com). Sure, Trump apologized via video on Facebook late last night. But he won’t stop being a misogynist, or seeing people as meat. Heck, the Central Park 5 are still guilty and still deserving of the death penalty in his mind, and the jogger whom had been raped in 1989 is still only a “broken woman” and a “victim.” As far as Trump is concerned, his America consists of 320 million stalls of meat that he “can do anything” with at any time and expect to get away with it. But if you think that this mindset has merely trickled down from the likes of people like Trump, you would be mistaken. American culture is so rife with a meat-market mentality, that I can smell the lean cuts of animal protein from miles away.